Definition at line 1789 of file lscript_tree.h. Definition at line 1792 of file lscript_tree.h. Definition at line 1797 of file lscript_tree.h. 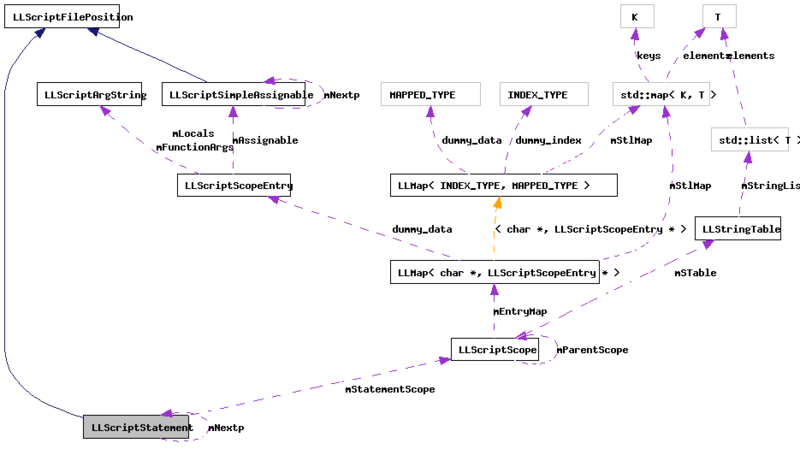 Definition at line 7332 of file lscript_tree.cpp. 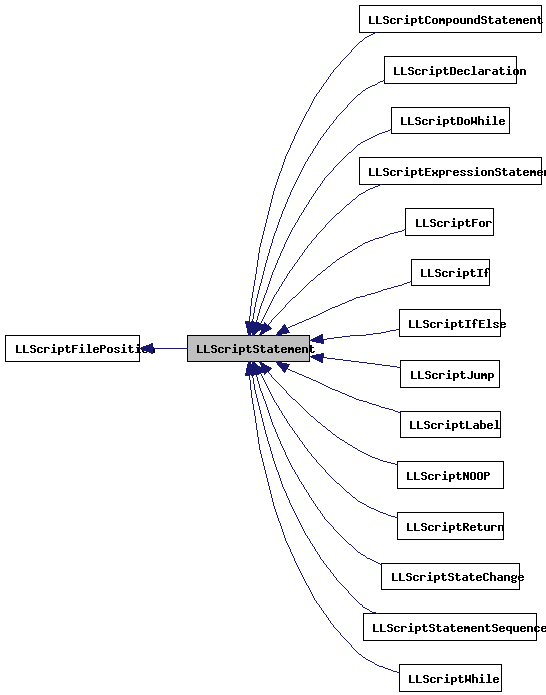 Reimplemented in LLScriptStatementSequence, LLScriptNOOP, LLScriptStateChange, LLScriptJump, LLScriptLabel, LLScriptReturn, LLScriptExpressionStatement, LLScriptIf, LLScriptIfElse, LLScriptFor, LLScriptDoWhile, LLScriptWhile, LLScriptDeclaration, and LLScriptCompoundStatement. Definition at line 7346 of file lscript_tree.cpp. Definition at line 7352 of file lscript_tree.cpp. Referenced by LLScriptCompoundStatement::recurse(), LLScriptDeclaration::recurse(), LLScriptWhile::recurse(), LLScriptDoWhile::recurse(), LLScriptFor::recurse(), LLScriptIfElse::recurse(), LLScriptIf::recurse(), LLScriptExpressionStatement::recurse(), LLScriptReturn::recurse(), LLScriptLabel::recurse(), LLScriptJump::recurse(), LLScriptStateChange::recurse(), LLScriptNOOP::recurse(), and LLScriptStatementSequence::recurse(). Definition at line 7341 of file lscript_tree.cpp. Referenced by LLScriptGlobalFunctions::recurse(), LLScriptEventHandler::recurse(), LLScriptWhile::recurse(), LLScriptDoWhile::recurse(), LLScriptFor::recurse(), LLScriptIfElse::recurse(), LLScriptIf::recurse(), and LLScriptStatementSequence::recurse(). Definition at line 1812 of file lscript_tree.h. Definition at line 1810 of file lscript_tree.h. Referenced by addStatement(), and gonext(). Definition at line 1811 of file lscript_tree.h. Referenced by LLScriptCompoundStatement::recurse(), and ~LLScriptStatement(). Reimplemented in LLScriptReturn, LLScriptIf, LLScriptIfElse, LLScriptFor, LLScriptDoWhile, LLScriptWhile, and LLScriptDeclaration. Definition at line 1809 of file lscript_tree.h.